I decided recently that my very first bench – a 2×4 and mdf bench screwed and doweled together – wasn’t working for me anymore. Actually when I finally dismembered it, I realized that most of the dowel joints had failed! It had twin pipe clamps as a face vise. Worked ok for a while, but we are talking about moving in the next couple years (we rent now) so I figured I’d better get a stout portable bench built now while I still had a bench to build it on! This is from plans from Will Meyers, with my own adaptations. 3” hard maple top (5/4 paint grade that I got for a pretty good price from my local lumber yard – $1.75/bf), Douglas fir undercarriage, yost vise screw, and a 1.5” wooden screw for the tail vise. 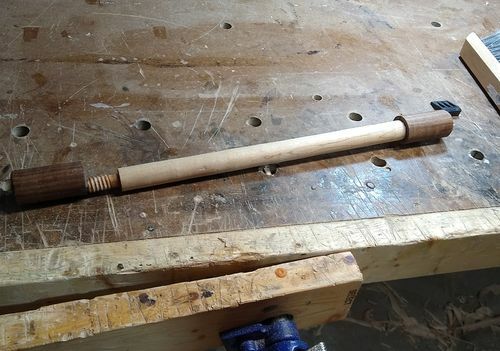 I actually had to turn the wooden screw on my spring pole lathe because I needed it a bit longer than my bench top mini lathe could fit between centers! That was fun… Used a threading kit to cut the threads in the screw and the end cap, and a garter and 1/4-20 bolts (in holes threaded with a metal tap) to secure the garter. I love this bench! I’m comparison to my old bench this one is a dream to work on, and I feel like I am a lot more efficient with it! No more fiddling with my pipe clamp vises. The leg vise had a pin board, but I also have a wedge down on the floor that I can just kick to adjust for up to about 2” workpieces. This build only took me 2 months, working with a combination of bandsaw, lunchbox planer, drill press, and hand tools. I believe I could do it even faster if I did it a second time, but I think that was pretty quick compared my usual pace with furniture. thats a great looking bench that should serve you well for many years. Nice work, Jeremy. I like the wagon wise, you got that screw inside there well. Don’t forget to your entry in the Workbench Smack down thread. You should build one! It’s so nice! I really like your wagon vise implementation. Turning with a spring pole sounds like a hoot. Thanks! I really like the wagon vise. That opening being a bit wider opens up a lot of clamping options,and the two dog holes mean I never need to move the screw more than like 1.5”. The spring pole lathe really is a lot of fun once you get the hang of it. Wouldn’t want to turn a ton of stuff on it, especially large stuff. But it cost me like $40 to build, and it all knocks down, so will be easier to move out of the basement than a larger powered lathe likely would be. And it’s a great conversation piece. I would want this just for the vise alone…. I could entertain myself for hours without ever accomplishing anything. I’m easily amused. I would want this just for the vise alone…. I could entertain myself for hours without ever accomplishing anything. I m easily amused. Honestly, I’ve been doing just that. Lol. The leg vise is really fun, and the wagon vise I just turn round and round and push the spring loaded dogs up and down. The one end of the handle of the leg vise is threaded too, so yet another thing to play with. Beautiful bench, what makes a Moravian bench a Moravian bench? Is it the added depth or the cant to the legs? The hardest thing you’ll have to do now is going to be beating on it the first time. It’s based on a portable bench from a Moravian village in old Salem north Carolina, popularized by Will Myers. I’d say it’s distinguishing characteristics were its slanted legs, leg vise (though the original had a vertical vise on a separate plate thingy mortised into the top), a narrow bench top (will Myers made his only 14”, mine is 18”) with a tool tray on the back, and the tusk tenons. Also the top just sits on dowels and isn’t permanently attached to the base. The tusk tenons and doweled, narrow top make the bench easily portable, which I believe was the intention with the original. It s based on a portable bench from a Moravian village in old Salem north Carolina, popularized by Will Myers. I d say it s distinguishing characteristics were its slanted legs, leg vise (though the original had a vertical vise on a separate plate thingy mortised into the top), a narrow bench top (will Myers made his only 14”, mine is 18”) with a tool tray on the back, and the tusk tenons. Also the top just sits on dowels and isn t permanently attached to the base. The tusk tenons and doweled, narrow top make the bench easily portable, which I believe was the intention with the original.